As a priest who celebrates the Latin Rite Mass in both forms (the Extraordinary Form which is typically called the "Latin Mass" and the Ordinary Form which is your typical parish Mass today) a question has been hanging out there for me this year - which liturgical calendar do I live by? The calendars for the two forms of the Latin Rite are very similar, although on certain days, they can vary widely. This is perhaps no more so than today. In the Extraordinary Form of the Mass, today is the 6th day of celebrating Pentecost. It is by no means a day of fasting, but instead is to be celebrated as a very holy day. However, in the Ordinary Form, today is a normal Friday in ordinary time, and is, for those who so choose, a day of some form of penance or abstinence in rememberence of Christ's sacrifice on the cross. The Holy See clarified the issue a bit in 2008 when they noted that major feasts and days are to be celebrated according to the Ordinary Form's calendar. So, for example, in the U.S., the Ascension is transferred to Sunday, and so even if one went to an Extraordinary Form Mass on "Ascension Thursday" the Mass would have to be a regular Mass. What the Vatican's letter does not cover is what happens when a feast arises (such as this Octave of Pentecost) which is ONLY celebrated in the Extraordinary Form? Or what happens with the feast days of saints that are in the "old" calendar, but not in the "new" one? It seems to me that Rome might be moving to clarify this - it would certainly be helpful? I am a big fan of music. A group I really like that is probably at the edge of metal/noise/punk that I like in my music is the band "Cage the Elephant." A video of theirs that I really like is from a song that is making its rounds on the radio titled "Back Against the Wall." "When an unclean spirit goes out of a man, he goes through dry places, seeking rest, and finds none. Then he says, ‘I will return to my house from which I came.’ And when he comes, he finds it empty, swept, and put in order. Although the background art is very punkish, I think the message is an interesting one, and I can see how someone coming from a cult background might never have learned what one is supposed to fill one's soul with once one has swept it clean. Thanks be to God for Christ and His Church! One correction - as I looked back on it, if I gave the impression that tambourines, liturgical dance, and priests who don't prepare homilies are the ONLY abuses that are blamed on the Holy Spirit then I messed up. I meant to suggest that those are three very small examples, and I probably should have done a better job of explaining what some other types of abuses are because the number and type of abuses done in the name of the Holy Spirit is beyond count. 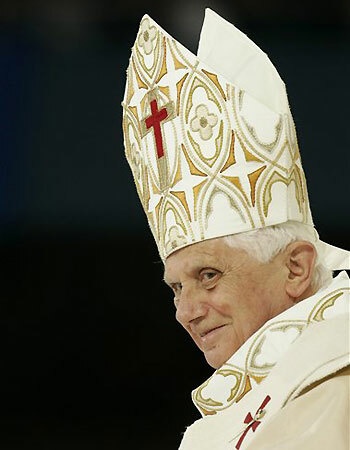 Today has been designated by Pope Benedict as a world day of prayer for China. Not only is China one of the last strongholds of Communism (which thus means it is staunchly atheist - one of Marx's central teachings), and so a persecutor of Catholics, there is also a split in the Catholic Church itself in the country. There are two Catholic Churches in China, the public Church and the underground Church. The public Church has bishops appointed by the government and the underground Church has been appointing its own bishops while operating clandestinely so as to avoid persecution. The government tolerates the public Church because it feels it is better to have influence and control in the naming of bishops then to force all Catholics underground. The Vatican has thus been placed in a difficult position of trying to figure out how to best support the millions of Catholics in China. The Vatican does not like being told who a bishop of any diocese WILL be by the government, but it also knows that if it appoints its own, or ratifies the bishops that the underground Church appoints, then it will be inviting persecution. The Vatican has adopted a policy of "reviewing" the appointees by the government, and it sounds like, so far, the Vatican has signed off on 100% of the recommendations. This allows either the Vatican or China (depending on your point of view) to save face. The real losers in all of this are the Chinese Catholics. Many are confused as to who to follow, and many are also persecuted. Today, let us pray in a special way for the Chinese Catholics and the Church in China - may it be strengthened in its battle for Truth! Let us also seek the intercession of St. Francis Xavier, China's patron saint. TIME Magazine has a story on Germany's birth rate dipping to a historic low. The article is titled: "Baby Gap: Germany's Birth Rate Hits Historic Low." The article goes in to reasons why it has dipped so low. The author talks about all kinds of factors such as the condition of hospitals and the fact that school gets out at 1 p.m. and so families are struggling to find baby sitters. The two things not mentioned in the article - artificial birth control and abortion. Denial ain't just a river in Egypt! Is Bishop Olmsted's act in this case the first move to help reign in some of the religious sisters who have been obstinately defying the Bishops of this country at every possible opportunity? A very interesting speech was given last month by Archbishop Raymond Burke (formerly of St. Louis) who now sits at the Church's number 3 post. He has long been leading the charge to help remind people who holds the teaching authority in the Catholic Church. Some portray this as theological chest pounding but imagine yourself placed as the head of a diocese; you are made the chief shepherd. You are also now made responsible for the souls of all of those in your diocese, Catholic or not, which means that when you die you will be asked to make an accounting for the state of every soul placed under your care. You are asked to lead these people to Christ through the Sacraments and the teaching of Christ's Church. Now imagine someone stands up and says, "The Bishop is wrong - to be authentically Catholic you need to be going THIS way, follow me!" You HAVE to stand up for the teaching authority of the Church and thus for your own teaching authority - EVEN AT THE RISK OF SOUNDING LIKE YOU ARE AN ARROGANT WIND BAG WHO JUST WANTS PEOPLE TO RESPECT YOUR AUTHORITY." 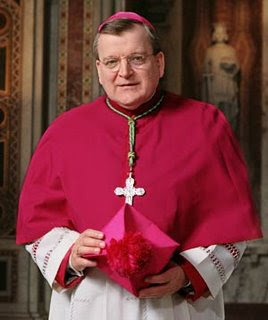 Here are some of the comments made by Archbishop Burke (soon to be Cardinal Burke). May God bless our Bishops as they continue to lead us through a most tumultuous and confusing time. "[...Our joy today is] overshadowed by the public and obstinate betrayal of religious life by certain religious. Who ever could have imagined that religious congregations of pontifical right, would openly organize to resist and attempt to frustrate an apostolic visitation, that is, a visit to their congregations carried out under the authority of the vicar of Christ on earth, to whom all religious are bound by the strongest bonds of loyalty and obedience? Who could imagine that consecrated religious would openly, and in defiance of the bishops as successors of the apostles publicly endorse legislation containing provisions which violated the natural moral law in its most fundamental tenets – the safeguarding and promoting of innocence and defenseless life, and fail to safeguard the demands of the free exercise of conscience for health care workers? We witness a growing tendency among certain consecrated religious to view themselves outside and above the body of Christ as a parallel institution looking in upon the Church with an autonomy which contradicts their very nature. We have certainly come a long way from the total loyalty to the Roman Pontiff which was at the heart of the foundation of the Society of Jesus and of every religious congregation. Religious life lived in the heart of the Church, and for that reason religious congregations are, by their very nature, bound in strictest loyalty to the Roman Pontiff. It is of course an absurdity of the most tragic kind to have consecrated religious knowingly and obstinately acting against the moral law. The spiritual harm done to the individual religious who are disobedient and also the grave scandal caused to the faithful and people in general are of incalculable dimensions." Part 2 of this story involves the shocking break by some religious sisters from the teaching and leadership of the Bishops of the United States with regards to health care reform last month. President Obama signed into legislation the Health Care Bill on March 23rd. In all of the last-minute back-room negotiations, including the unforgettable cave in by 9 "pro-life" democrats, a key to all of it was an 11th hour endorsement by Sister Carol Keehan, the leader of the CHA. The endorsement carried the signatures of numerous other leaders of Catholic Sisters from around the United States. In the wake of the endorsement it was often trumpeted that the signatures represented "60,000 Catholic Sisters" although that number has since been disputed heavily. Regardless, Sister Keehan was one of 22 people invited by President Obama to the historic signing of the Bill, and she was given as a gift for her work on of the pens used to sign the Bill. Indeed, the support of Catholic Sisters was also trumpeted by Speaker Pelosi herself the night the bill passed the house as she rattled off a list of those to be thanked. 2) The fact that nothing was in the Bill to protect the consciences of Catholic health care workers and doctors (meaning nothing in the Bill protected the right of a Catholic doctor to NOT have to perform an abortion). It is clear that every Catholic be reminded of a simple teaching of the Church: in each diocese the Bishop is the LONE INTERPRETER on decisions and issues involving faith and morals. I'll say it again - the LONE INTERPRETER. The actions of these sisters is thus unexplainable - you can't teach differently than your Bishop as a Catholic in the Church. If you want to endorse the Health Care Bill (certainly an issue which would fall under FAITH AND MORALS) then just do the honest thing and LEAVE the Church. Then you can endorse it all you want! But to stay in the Church, to claim to still be a religious sister in good standing with the Catholic Church, and to cause a GREAT deal of confusion among Catholics across the country, that, for me, evokes a passage from Matthew's Gospel which says that we should "beware of the false prophets who come in sheep's clothing..."
The argument made by many trying to rationalize or defend the decision of those religious sisters who signed the letter endorsing the bill was this - "The Bishops are old, out of touch, administrators who don't know the first thing about actual Christian charity or caring for the sick and vulnerable. The sisters, on the other hand, are on the front lines of the hospitals doing the work, seeing the sick, etc. It is their expertise that ought to be listened to here." What a dark, dark precedent that sets! The idea that the Holy Spirit would actually mislead the Bishops of this country, speaking in unison, is such an unfathomably dark proposition that it shutters me to think that some believe it. I also struggle to come up with a more anti-Catholic mindset than this one. Let us pray for the religious sisters throughout our country (many were STRONGLY opposed to the Health Bill as it was signed) and let us pray for all those who are now thoroughly confused as to what exactly it means to be a Catholic today. Finally, let us pray for all of our Bishops who have the most unenviable task of trying to lead their flocks to Christ, even while some within the flock are pointing in the wrong direction. Religious sisters seem to be in the news a lot recently. "The process, which is expected to take about two years to complete, has several stages. First, Mother Clare [appointed to head the visitation] will solicit voluntary input from the superiors general through inviting them to make personal contacts with her in Rome or in the United States. During the second stage, the major superiors in the United States will be asked for information such as statistics, activities and community practices. Selected on-site visits will be made during the third stage. During this time, the sisters will have an opportunity to share with the visitation teams their joys and hopes, challenges and concerns about their lives as women religious in the Church today. The final stage will be the compilation and delivery of a comprehensive and confidential review by Mother Clare to Cardinal Rodé." Some groups of sisters are very upset by the visitation, seeing it as a crackdown by the Church which they perceive to be enforcing orthodoxy upon them. The interesting thing is that the Vatican conducts visitations ALL THE TIME, as in CONSTANTLY. The seminaries in the U.S. were just visited three years ago. No one complained then. The Vatican is on a rotating schedule of visiting seminaries, sisters, brothers, etc. throughout the world. In fact, I can't even find a record of the last time the U.S. sisters were visited, so needless to say, it has been a while. The time between U.S. seminary visits was something in the ballpark of 20 years. During stage 2, Mother Clare had to actually ask the various heads of religious sisters for more cooperation as an alarming number had either failed to turn in the questionnaires or were incomplete in their answers. The process is now on stage 3 with the beginning of on site visitations. Let us pray that this continues to be the healthy process that the Church envisions it to be. Pope Benedict, while visiting Portugal recently, repeated one of my favorite mantras of the Church - "The Church never imposes, She only proposes." Pope Benedict added on to that phrase when he noted, "The Church never imposes, She only proposes ceaselessly." I tell my young people all the time in class that especially in the role of teacher it is my job to say, "this is what the Church teaches. End of story. You need to learn it and I will hold you accountable for knowing what the Church teaches, but beyond that I can not MAKE you become Catholic." I think that is a good model for all of us in our daily lives as well - to propose but never impose. By what we say and by what we do Catholics are called to PROPOSE a way of life; to live in a way that is attractive precisely because we are rooted in Christ and His Bride, the Church. We've learned our lesson from history; imposing the faith never works and we are wiser today for that knowledge. 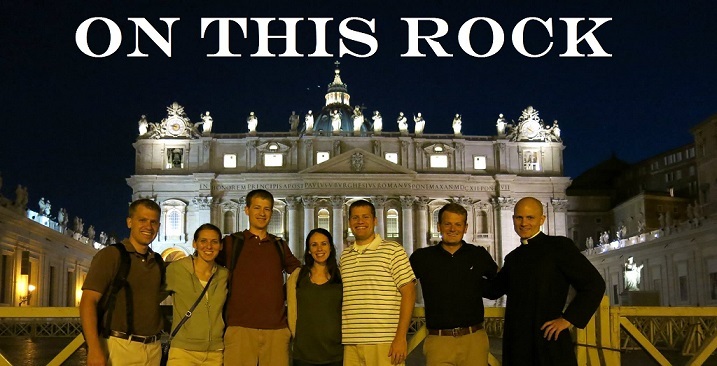 Let us be people who propose Catholicism ceaselessly to the world!!! This weekend I am filling in for Fr. Magiera at Holy Rosary's 9:30 Latin Mass. It is a sung Mass, plus it has the added bonus of being Pentecost, one of three days that is celebrated for 8 days instead of one (we've cut Pentecost out since Vatican II, and now only celebrate Christmas and Easter with octaves). So...if you are looking for an excuse to delay your ordinary time penitential observances - there you go. This next week can be the octave of Pentecost! I am very nervous for something like this, and the chanting always takes work. The good people at Holy Rosary are always most gracious to me, though, and they tolerate my squeaking! I am excited and looking forward to celebrating Mass there this weekend. If you are curious, please stop by. It isn't completely foreign, and there are books that can help someone follow along who is new to the extraordinary form of the Mass. Please pray for me that it goes well! Today's Gospel features Jesus last wish from the Garden of Gethsemane - "Father I pray for them also...that they may be one as you, Father, are in me, and I am in you." This phrase is very important for us as Catholics. We take this to be Jesus asking for unity among his entire flock. Often times people take this to mean that Jesus was praying for "spiritual" unity, and that we are one, despite our differences of "religion." This suggests that our "religion" is something that really is quite trivial and ultimately can be easily transcended. This mindset ultimately believe that there is some higher plane where the "visible church" (the container of all the corruption, sin, scandal, and evil hierarchical machinery) disappears and we all join one another in a purely spiritual communion. We do well to remember, however, that as Catholics this is considered a heresy. When we hear Jesus pray "That they may be one" we believe that he desires for us to be united in a "visible church" as well. The question then becomes which visible church is able to gather all together. The answer seems fairly clear at this point. Pope John Paul II wrote one of his encyclicals on this subject, and the Latin title of the encyclical is "Ut Unum Sint" - "That They May Be One." I include it here as a link for anyone interested. The document centers around the issue of how to dialogue with other faiths in order to seek unity among them so "that we may be one" some day. This is a segment of our video announcements from Ritter that I helped put together. I help teach the TV/Broadcasting class at school, and we wanted to cover prom but all the kids were going to be attending prom. I volunteered to help cover the event, and Ms. Fine and myself obviously had too much fun! What the Church has to say to all those who believe that the Mass is about being entertained, and thus deprived of value if it fails to do so. The Archdiocese has helped sponsor a very interesting contest throughout the month of May. The contest is for all the employees and their families and is called "500 miles of May" or something along those lines. An outside wellness company has set it up, and all those interested signed up in teams of 5. The pedometers were mailed to each person near the end of April, and at midnight on May 1st, the walking began. I joined a team with my brothers Matt and Tony, along with Andy Cain and his wife (Andy is a math teacher at Ritter). We took the name "The Wet Bandits" (my brother's choice) as an ode to our family's favorite movie - Home Alone. With athletics and things of a similar nature, my family is full of really competitive people. So in an effort to not let my team down, I decided, in the first week of the competition that I would walk from Ritter to Malachy after school and then walk back to Ritter the next morning. The funny thing was that it didn't really vault us up the leaderboard, but that isn't why I write this post. G.K. Chesterton once said something along the lines of "a machine is only good when it gets you away from machines and encourages you to go out and enjoy a fresh field of clover." To that extent, this little pedometer has been a life saver. Last Sunday, my brother Tony and I went out for a 10 mile walk (at that point we just wanted the contest to be over more than anything) and our other brother who is not in the contest tagged along for fun. We had three hours together of talking, laughing, and encouraging each other in our various states of life. When I walked to Ritter, I saw lots of things that I NEVER notice when I drive. Once every couple of weeks I'll hit up the Starbucks at 56th and Lafayette. In walking past there, I realized that there is also a locally owned coffee shop in the same shopping plaza. This walking thing has been one of the most spiritually enriching activities I've been a part of for a while (excluding the Sacraments of course), and I never would have thought it would be so great! Maybe God is calling you to take a walk today! 10 AM Malachy Mass - our "visitor"
For all who are wondering what went down at the 10 am Mass with our "guest speaker" I thought I'd post something briefly. I was going to attach it to the video of my homily, which I hope to get online today, but I figured I'd clear this up now. The short answer - I have no idea what was going on! I first noticed the gentleman when he stood up at the presentation of the gifts and got real close to me. I couldn't make out what he was saying, but I think he wanted to put his cross on the altar. I told him he needed to just please have a seat. Later, at the sign of peace, he came into the sanctuary and was waving his cross to show it to everyone but he sat down again. The capper was his 1 minute speech right before the announcements (or was it after, I can't even remember it was so discombobulating!). I don't know exactly what his talk was about, but I was trying to usher him to his seat, but he wouldn't budge. Finally, I think he got the hint, and had a seat. After Mass, I talked to him briefly about how he can't be doing what he did, but he wasn't really listening. It was fairly clear after speaking with him that there were some mental problems going on. I learned this morning from a teacher here at Ritter that these guys eventually had a restraining order slapped on them at Our Lady of the Greenwood. I told people afterwards - "That's what I get for preaching about how the Mass isn't supposed to be entertaining!" Let's pray for those two men! "The Greatest Trick the Devil Ever Pulled Was Convincing the World He Didn't Exist!" I was asked by Bethany Mcewan, an English teacher at Ritter, to talk to her classes about Satan. I had given a homily about how Satan tries to ensnare us, and as her classes were reading over the Crucible (about the Salem Witch Trials) they had a lot of questions about Satan. Their textbook wasn't much help either, as the "professors" in their book said that Satan was mostly a creation of humanity to keep people under control or to help place the blame for mental illnesses and so forth - it was the same stuff people like that always say. 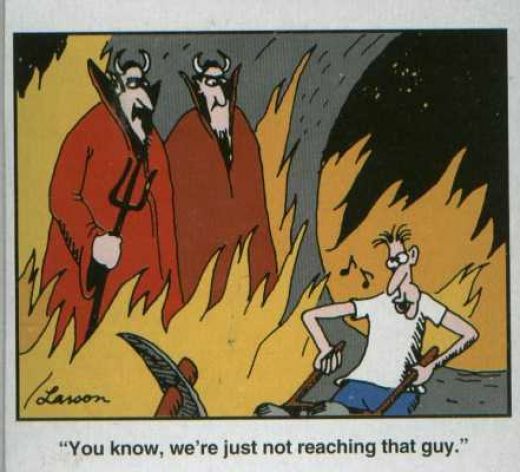 If Satan is mentioned in our world today, it is mostly as a cartoonish figure with no real power. I titled my talk to the juniors, then, "The Greatest Trick the Devil Ever Pulled was Convincing the World He Didn't Exist." That is a quote originally found in a movie called "The Usual Suspects" and I think it contains a lot of wisdom. That helped the young people first of all understand that what the "English professors" are saying about Satan plays right into his hand; they are saying exactly what he wants people to think. We also talked about how usually people think that you have to worship Satan in order to be doing his work. However, I mentioned that if Satan is the most prideful soul ever, then would he really care if we worshiped him? Of course not. He just wants to wreck God's plan; if he can do that, he is most pleased. How then does he work? We looked at three clips from the "Passion of the Christ" that feature Satan. All of them are very beautifully done, and are an artist's interpretation alone, but nonetheless they all illustrate the same point - Satan works behind the scenes, manipulating people, and he loves the fact that no one sees him in the shadows pulling strings. This may be my favorite clip from any movie - it shows Mary staring Satan down (who is again walking just behind those who are doing his work (in this scene the temple guards and the Sadducees). This is Gibson saying "those who want to see Satan will see him, but you have to know where to look." Finally, to bring it to the present, I read to them part of the lyrics from an Usher song entitled "My Little Freak." If you want to see what the young people are listening to today, I challenge you to look up those lyrics. I had heard it on the radio a few days earlier, and I knew I needed to speak about it to them. Certainly music has been getting more sexual since the early 1900's, but this song is over the top. There is absolutely nothing redeeming about it whatsoever. I talked to the kids (pretty wide-eyed after hearing me read them the lyrics to their favorite song) about how no one involved in bringing this song about would say "Oh yeah, I worship Satan." Some are motivated by money, some by fame, but I doubt any are motivated by pleasing the Lord of Darkness - and again, that is exactly how he wants it. May we spot the Prince of Darkness in the midst of all of his deception, and may our young people fight the good fight! Pope Benedict initially laid this challenge at the feet of priests on January 24th of this year. However, just today the Holy Father AGAIN asks priests to do the same - to use blogs/videos/anything else that will help spread the Gospel. Pope Benedict issued this statement on today's World Day of Communications which I preached about two weeks ago (see video below). It is amazing that an 84 year old man has his finger on the pulse of modernity so thoroughly. He is awesome! We just finished our last intense section with a good test that the students did really well on. Over the past couple of weeks we've been talking about marriage/sexuality and some of the Church's teachings. We hit the big ones in talking about contraception, in vitro fertilization, homosexuality and finally we looked at what the Church says about homosexual persons adopting children. It was very interesting - I was expecting a battle over contraception but the students all thought the Church's teaching on that issue made sense. The young people were MUCH more into the issue of homosexuality. As I was teaching it, I got to thinking that I'd love to write a book laying out the Church's teaching on such matters, especially homosexuality. I'm sure someone has done it well elsewhere I've just never seen it yet. I then told them that the other teachings that follow are founded on the above two teachings. I told them if they don't agree with the above teachings, then it makes little sense to argue about a teaching that follows from those two principles. We talked about how they need to deal with whatever it is that is snagging them and not worry about all the other stuff that follows. To use a math analogy: it is useless to get mad about the definition of a square if you don't really believe that one of Euclid's 5 founding axioms of geometry are accurate. If, for example, you don't believe that two points make a line then worrying about a teaching which is founded on that definition is pretty pointless. The young people seemed to get that. I also appreciate their questions! It was a very good few weeks of discussion! I LOVE a good film. I have a passion for working with film editing (which I help teach at Ritter) and so I like to watch true artists at their craft. Along these lines, let me first of all plug a movie that is several years old - The Family Man. It stars Nicholas Cage and Tea Leoni, both of whom show amazing acting ability. I had only seen Leoni in "Bad Boys", and some other forgettable movie - and so her acting in The Family Man blew me away. I mention it because we just watched it in my classes at Ritter. We just finished looking at some of the "do not's" of the Church with regard to marriage (IVF, contraception, homosexuality) and are going to finish the year looking at the tons of great stuff the Church has to say about marriage in a positive sense. With some movies, the more you see it the more it gets boring. The more I watch The Family Man, the more I am blown away by the film. The script is pure genius, and every scene tells a story. The film is PG-13, although there is an F-bomb (we skipped it in class), and there is also some sexuality - but all of it is shown for a good reason. If you are ever looking for a good film that looks at the dignity of marriage, pick up the family man - there is a ton of Catholic teaching on marriage just beneath the surface. Now to the present - next weekend sees the release of Robin Hood which teams up Russel Crowe with his Gladiator director Ridley Scott. Gladiator was subtly Catholic enough for me - in the Robin Hood trailer it looks like Robin Hood's Catholicism will be on display as we see Crowe at one point make the sign of the cross. I'm Curious to see how it is treated in the film, but mostly I'm just excited for a film that looks to be very well made. See you in the theater! What REALLY happened at Vatican II? An issue I've been reflecting on a lot over recent years is the issue of the Second Vatican Council. In my various assignments I am exposed to Catholics from all over the theological spectrum, radical liberals, radical conservatives, and everything in between. The interesting thing for me in all of this has been realizing that people at the extremes of BOTH sides in the Church seem to detest the Council. There are the liberals who feel the Church didn't go far enough and should have allowed the ordination of women and/or permitted the use of birth control. There are also extremists on the conservative side who hate the Council because of an inability on their part to separate the train wreck that is the average parish liturgy today from the vision of the Council Fathers - these folks think that the Second Vatican Council WANTED liturgy to be done the way it is done in the average parish today. There seems to be a simple path out of the confusion and that would be to actually read the documents. Pope Benedict, Pope John Paul II, Dietrich Von Hildebrand and Henri De Lubac, all key players in the Council, have been trumpeting this message for years. Interestingly as well, all of these figures warn STRONGLY against what is typically referred to as "the spirit of the council." As I told my class, when you hear someone talk about "the spirit of the council" you should run far away! Each of these great men of the Council in their various ways commented in the aftermath of the Council that the Council was being hijacked by people with horrible intentions. De Lubac, 1967: "It is clear that the Church is facing a grave crisis. Under the name of "the new Church,""the post-Conciliar Church," a different Church from that of Jesus Christ is now trying to establish itself:...which is allowing itself to be swept along in a movement...under the pretext of renewal, ecumenism, or adaptation." Hildebrand, 1967: "It would be difficult to conceive a greater contrast that that between the official documents of Vatican II and the superficial, insipid pronouncements of various theologians and laymen that have broken out everywhere like an infectious disease." (Trojan Horse in the City of God, 9). 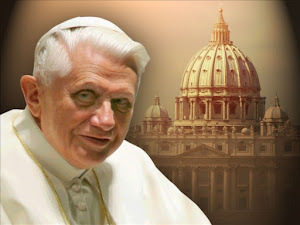 Pope Benedict, 1980's: "One found oneself facing a progressive process of decadence that to a large measure has been unfolding under the sign of a summons to a presumed ‘spirit of the Council’ and by so doing has actually and increasingly discredited it.” (Ratzinger Report, 30). Per the request of Pope Benedict, and on the eve of World Day of Communications (May 16th this year) which is a day that the Church encourages the flock to use all means of communication available to spread the Good News, I have decided to fire this nearly dead horse back up again. I am retooling what I do here, and am experimenting with ways to link Facebook, Youtube and this blog together. I hope to post on here video footage of homilies, and may even expand into some classroom videos of interesting topics. I think the video route is the way to go. I hope to also post texts of homilies on here when I can - although I not big into writing out my homilies all the way unless it is a really big occasion where I need to get the wording exactly right. Usually, it seems the people appreciate the eye contact. I hope all of you are doing well. If you have suggestions for things I can do to enhance the blog or reach others through the internet, please don't hesitate. As Christ says - "CAST OUT INTO THE DEEP!" God bless!